We all know that a dining room needs a table and chairs, but what kind of a table and which chairs? Consider your options before rushing out to the store. What kind of space do you have? Is it a dining room or a dining area? If you are furnishing a dining room how often do you use it? How will you use your dining room? Is it just for dining or will it be a multi-purpose room? Will small children be using it? A cavernous room with a small table will look cold and empty, while a too small space with a large table and chairs will seem unpleasantly crowded. Always measure your room before buying furniture, and remember to leave enough room around your furniture to move around easily. If it is a fairly large room, you may want to consider including other pieces of furniture such as screens, sideboards or china cabinets. If you want to downplay the size you may also want to use heavy drapes or large rugs. Wider, bigger or upholstered chairs or chairs with arms may be used. 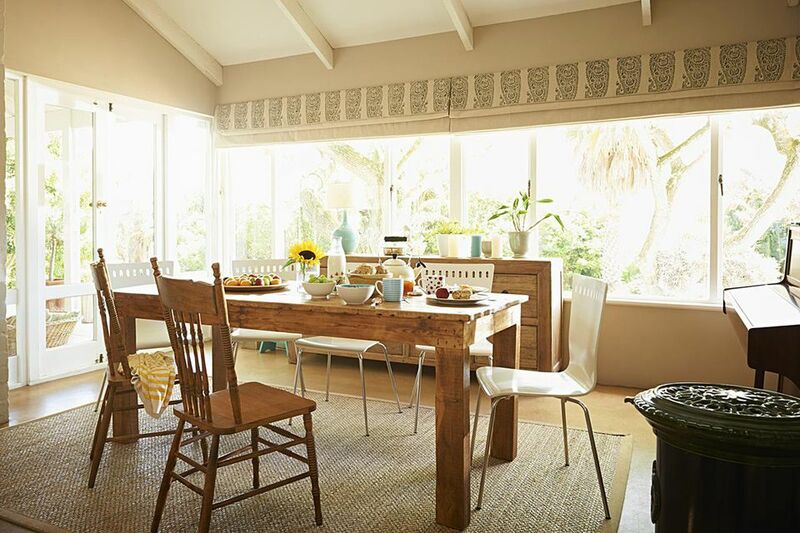 Before you begin furnishing your dining room, determine how you would normally use it. Will it be used every day, or only once in a while to entertain? A seldom used room can be furnished with high maintenance finishes and fabrics while a dining room that is used every day should be more functional. Look for sturdy and easy to clean furniture surfaces if young children will be eating there. If you use your dining room to work, read or converse, consider comfortable chairs. Do small children use it? Consider hardy finishes and fabrics that can be cleaned easily. For a seldom-used dining room, you may even consider designating some other purpose to it more suited to how you live. It's just a dining room only if you say so. Now that you have figured out the best way to use your dining room according to your needs and the amount of room you have, decorating it should be easy. It is about functionality and your personal preferences. For a large dining room, you may want to visually divide the large area into smaller ones with the help of rugs and screens. You can also buy furniture that is larger in scale. Heavy drapes, and paint color may also help. The idea is not to make the place seem small, but cozy and inviting. Open up a smaller space by using colors that provide a background that makes your space look bigger. Do not clutter it with unnecessary decor, but mirrors or other reflective surfaces might be helpful. There are many options for dining room lighting: chandeliers, pendants, sconces or floor lamps that come in many different styles from cutting edge contemporary to nostalgic traditional. Don't forget candles for those special occasions. Whatever source you choose for lighting, make sure it has a dimmer switch, so that you can adjust the amount of light you need. One rule of thumb for hanging chandeliers: there should be at least 34" inches of clearance space between the chandelier and the table. If it is a wider chandelier, make sure that people won't bump their heads when getting up or sitting down. If you use your dining room as a home office, remember to have appropriate task lighting. Is a Coffee Table the Answer for a Living Room Centerpiece? Dining Table Shapes: Which One Is Right for You?